What could be more romantic than being out in the fresh air with your loved one close by? 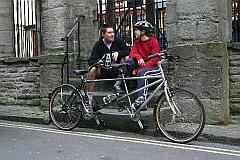 Well, you can't get much closer if you are both on a tandem bicycle! This weekend break makes a wonderful, romantic birthday gift and will be perfect if you dread thinking of an imaginative Valentine present every year. Our tandem cycling break is the perfect way to spend some time together, and to discover the beautiful back roads of Mid Wales. Any Drover Holidays cycling route can be done on a tandem (usually for a small supplement), but we've also put together a particular itinerary specially suited to a tandem bike. This cycle route follows the Wye Valley from Rhayader to Hay on Wye, via Builth Wells. You will ride through the heart of Wales over two days, lapping up the mountainous scenery without having to engage your lowest gear too often! The beauty of this tandem route is that it avoids big hills and follows the Wye Valley, so the lie of the land is on your side. Stay overnight in carefully selected B&Bs offering the little touch of luxury which makes this break perfect for anniversary or valentines presents. February can be a little chilly(!) for the actual riding, so why not book ahead and we'll give you a voucher to give your loved one on Valentine's Day itself. Then you can look forward to taking your tandem break during a sunnier season! This package is also perfect as an unusual gift for a couple - be it mum and dad's silver wedding anniversary or a wedding gift for couple who really don't need another set of bed linen! And if you're under the impression that only super-fit experts can handle a tandem cycle, think again! Our tandem cycling break can be tackled by complete beginners - though it will appeal to seasoned cyclists and tandem aficionados too. Daily luggage transfer daily – so you ride unencumbered! Route map and background information for your ride. A bottle of champagne on arrival. Why not download the tandem cycling break pdf or fill in our enquiry form to find out more about a weekend package or tandem bike rental?